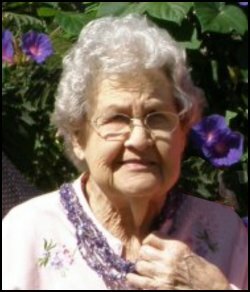 Doris Marjorie Hoffines Sciba died August 25, 2012, in Hallettsville, Texas. She was born October 7, 1923, in Houston, Texas. She is survived by her daughter-in-law, Shirley Herman Sciba of Sweet Home, grandson Eli Bohumil Sciba, and wife Stephanie Garza Sciba, of Manvel, grandson, Zachary Dean Sciba, of San Marcos; as well as a sister, Nina Hoffhines Thompson and her husband George, nephew Marc Alan Thompson and wife, Sharon, all of Birmingham, Alabama, a nephew, A. L. "Big Butch" Sciba and wife, Teddy Rush, of Vienna. Also surviving are two grandnieces, Karri and Rebecca Thompson; great-grandsons, Draq Anthony and Brandan Lawrence Sciba, of Manvel, and four step great granddaughters, Vanessa Fuentes, Andrea Huerta, Susanna and Sarah Salinas, as well as four step-great-great grandchildren, Natalie and Danny Fuentes, Nicholas and Nathan Huerta. She was preceded in death by husband, Victor "Pete" Sciba, whom she married December 31, 1950, son Lawrence Delmar "Little Butch" Sciba, mother Lee Viola Raleigh Hoffhines, and father Ralph Lloyd Hoffhines. After 20 years, Doris Sciba retired from Lavaca County as Deputy County Clerk. She was a long-time member of Hallettsville Garden Club, having served twice as president, and long-time member of Hackberry-Shiloh Homemaker's serving in several offices. She was awarded her fifty year pin from Hermann Sons and also held several offices there. She was active in the St. Peter's Lutheran Church with World Relief quilters, and Women in Mission. She taught Sunday School for a number of years, and served on the church council. She was very much loved.